Turning their back briefly on opera, The Strange Bedfellows are back with a cabaret that will definitely be more naughty than nice. Jacqui Dark and Kanen Breen are highly regarded opera singers. But there’s more to them than that. Moonlighting as The Strange Bedfellows, they have given cabaret a jolly good shake-up, garnering rave reviews for their shows Strange Bedfellows – Under the Covers and Strange Bedfellows – Bedlam, which were dark, decadent and deliciously bawdy, allied with exceptional musicianship. They are now teaming up once again with Musical Director Daryl Wallis for a new Christmas cabaret show called Prancer & Vixen. We asked them to spill at least a few beans as to what we can expect. Anyone who’s seen Strange Bedfellows will know that Prancer & Vixen is likely to be more naughty than nice. Can you tell us a bit about the show? J: Yeah, ‘nice’ is not a word that is often associated with The Beddies. There will be MUCH naughtiness, mischief, confusion, hilarity and pounding of hooves. Or hoofs. Or whatever. There will definitely be pounding. K: My lips are sealed; the only person I have to run the contents of the show past is my parole officer. Melbourne Recital Centre commissioned us to write a Christmas show, and so we did. They know not what they do! I believe you are planning a mix of Yuletide classics as well as other songs. Can you reveal some of what you will sing? J: A Bedfellow never likes to prematurely reveal any information about a show. Mainly because we often change our minds the night before. Or on the day. Or in the middle of a show, depending on our mood. Quite frankly, it’s a miracle that Daggers hasn’t had a nervous breakdown by now! K: I never know what I’m singing until Daryl plays the intro. If I don’t know the song, I rely on strong gestures and face pulling to carry me through. Presumably the Yuletide classics will have a bit of a twist? K: They have been twisted so violently that we have a chiropractor on speed dial. Has Daryl Wallis done special arrangements for you? J: Of course! We insist upon it! Ever since he won a Green Room Award for being our Musical Director and we didn’t, we try to torture him in any way we can, and bringing to life our hideously unmusical ideas is certainly both cruel and unusual. K: I believe Daryl has arranged one of his vegetarian tofu-turkeys for the Greenroom between shows – that should be pretty special. Is the linking patter Christmas themed? K: No, we will be discussing fiscal policy. Merry Christmas. Will the show put people in a festive frame of mind – or what can they expect? J: Hopefully, it will leave them laughing and exceptionally merry and well prepared for the silly season. As with any Beddies show, there are some utterly ridiculous numbers, some cheeky musical twists, and some moments of beauty… although we do try to limit those. It will probably also leave them gagging for a bevvie… and isn’t that really what Christmas is all about? K: What did you not understand about fiscal policy? The punters will be BEAMING. How do you both feel about Christmas? Do you look forward to it or does it hold horrors? J: I absolutely LOVE it, even more so since my little boy grew old enough to understand it. We indulge heavily in our traditional Christmas Day spaghetti bolognese and sparkling shiraz. And clinkers. K: I am not religious. You are shocked, I can tell. Christmas to me is the triple evil of crass commercialism, excessive expenditure and over consumption – I ADORE IT DARLING!!! J: For the first time in AGES, we’re travelling to Daylesford/Ballarat to spend Christmas with our families, The Dark Breens. We expect to mine a whole new show’s worth of material from this experience. K: I never make plans for Christmas. My silly season starts early and finishes late – it’s been a very long time since I’ve remembered anything which happens between late October and early March. 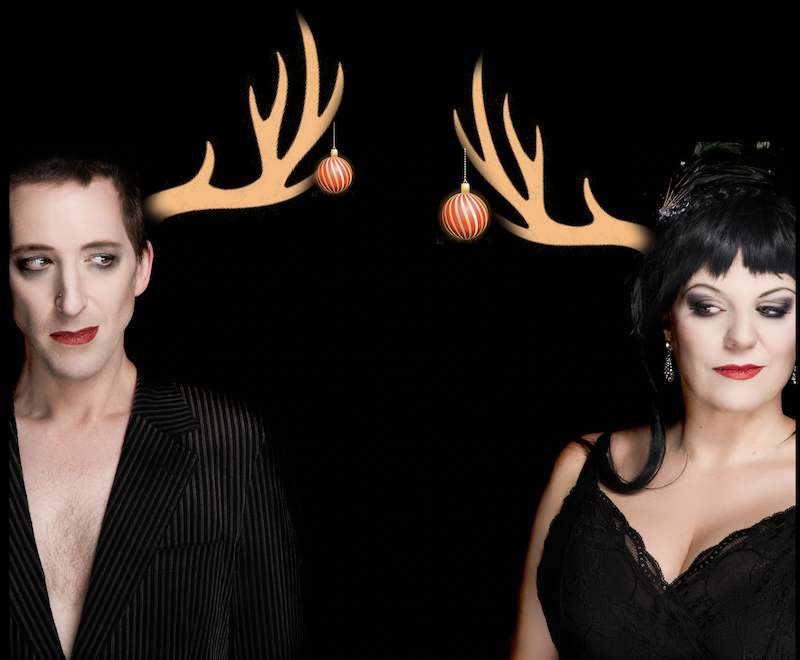 Prancer & Vixen plays at Melbourne Recital Centre, December 15 and 16.